Candy Cane Lane is the nickname given to a stretch of Second Avenue south of Foothill Boulevard where most of the homes are decorated for the holidays. Its local fame has been supplanted by the more outrageous Thoroughbred Street decorations in Rancho Cucamonga. 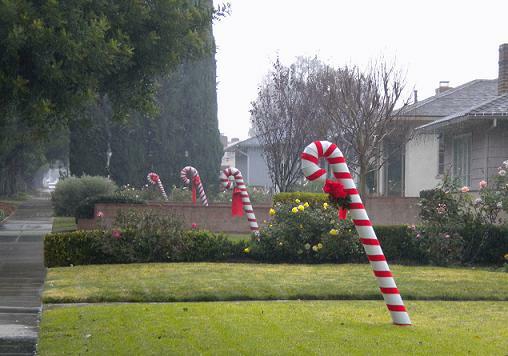 More than 30 oversized and identical candy canes are displayed this year in front yards on Second. They start at F Street, a block north of Arrow Highway, and continue to Mesa Court, a block south of Foothill. Can anyone fill her, and us, in? I’d also suggest she poll more neighbors. We moved from Pomona to Upland in 1958. The Candy Canes were up for Christmas that year and remember people talking of them being up in previous years. Glad to see they are still there. The Daily Bulletin (Daily Report) did an article on the lane in the early ’60s and if remember correctly, the Lane started with one candy cane, then two and finally there was an agreement among the residents for the candy canes to be displayed. Should a house be sold the candy cane stayed with the house. But like everything else nothing works the way it is supposed to — I can recall one or two houses that had no candy canes. I can’t remember if there was a lollypop lane, but there was something located close to the Candy Cane Lane. Thank you for the comments. Now I want to make welcome signs for our street next Christmas! The bulk of candy canes seemed to be between Foothill and 11th Street this year. When we first moved to the street, a neighbor told me that if we needed our cane repaired or replaced to let her know. Unfortunately I can’t remember who she was, but I wonder if there was some sort of candy cane fund! Being much younger than most on this street, I’d like to make sure it is a tradition that is continued. not mentioned but i remember on my way to work the candy canes were also on arrow.